The College is pleased to announce the appointment of Julie Anderson as Dean of the School of Nursing and Professor of Nursing, effective Aug. 5. Anderson is a distinguished nursing educator, researcher, administrator and policy advisor. She comes to St. Scholastica from the University of North Dakota, where she served as Interim Dean for the College of Nursing, Associate Dean for Graduate Studies, Associate Provost, and Acting Director of the Chester Fritz Library. She is currently a member of the National Advisory Council for Nursing Research for the National Institutes of Health, an evaluator for the Commission on Collegiate Nursing Education, and a member of Sigma Theta Tau, the Honor Society for Nursing, as well as the Society for Simulation in Healthcare. She has a distinguished record of research and clinical practice. She earned bachelor's and master's degrees in nursing as well as a Ph.D. in Education, Research Methodologies from the University of North Dakota. 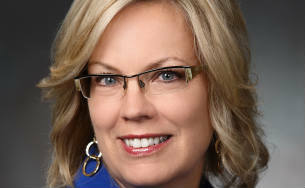 "We are delighted to be able to hire someone with Dr. Anderson's depth of experience in nursing and nursing education," said Beth Domholdt, St. Scholastica's vice president for academic affairs. "In particular she has very rich experience in rural healthcare, which is an important area for St. Scholastica." St. Scholastica's School of Nursing serves more than 1,000 students each year and is one of the largest nursing programs in Minnesota. "I am excited to join a program with such a striking history of quality," Anderson said. "With more than a century's experience in providing leadership, it is clear that St. Scholastica nursing's influence is felt in healthcare throughout the Midwest. I hope to build upon the excellence our faculty and graduates have achieved." Anderson will succeed retiring dean Martha (Marty) Witrak, who joined St. Scholastica in 1990. Witrak has been appointed Faculty Emerita in recognition of her outstanding service to the College.